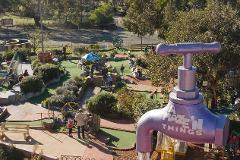 A Maze’N Things is a magical world of illusions, magic, puzzles, mazes and mini golf that provides hours of fun for the whole family. 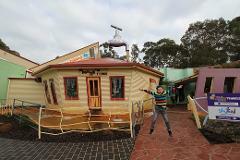 Easily one of the most entertaining family attractions Phillip Island has to offer. Open 10am to 5 pm. A Maze’N Things is a magical world of illusions, magic, puzzles, mazes and mini golf that provides hours of fun for the whole family. 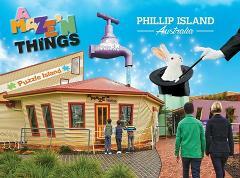 Easily one of the most entertaining family attractions Phillip Island has to offer. Open 10am to 5pm. We call our golf the Maxi Mini Golf because it is so big. The course is set on artificial turf with constantly changing landscaping and paving. The Skytrail is a 10 metre high adventure ropes course set on a zig zagging series of giant poles and platforms.